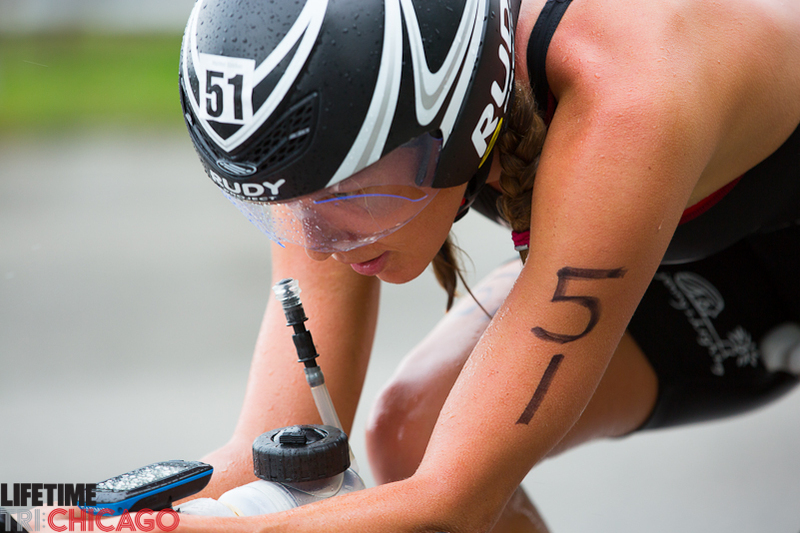 This past Sunday I competed in my 4th Chicago Triathlon and crossed the line earning my fourth win. Every race presents different challenges. This race was no exception as the sky opened up while we were out on the bike course! Fortunately the 9000 age group athletes were able to complete their races before the weather took a turn for the worse. The morning of the race I enjoyed an unusual sleep-in and took my time getting ready for the race. The Pro men started at 11:27 and we took off three minutes later. This course varies from the normal in that the swim is mostly point to point with an 800 meter run to the transition area. 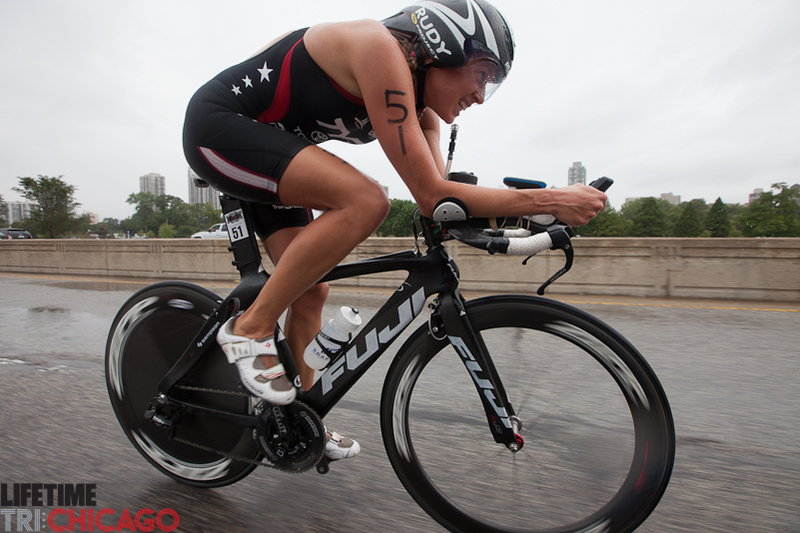 Just as I finished setting up my transition spot, the wind picked up considerably and dark clouds were rolling in. I had a Zipp 808 Firecrest on my front wheel, but decided I should switch to the 404 front due to the increase in wind. Nate had has own Fuji and rode back to the hotel and switched wheels while I ran down to the swim start. Since the transition run was quite long, I decided not to take any chances on injuring my feet by stepping on something, so I placed an extra set of shoes just outside the swim exit. I forgot an additional set of shoes, so I had to jog about 1000 meters barefoot to the swim start! I also forgot my swim cap in transition, but fortunately another athlete had an extra cap that just so happened to be silver (which was the color of the Pro wave). I borrowed a marker and marked up my new cap and was good to go for the swim! Once the gun went off, I started off conservative, but strong. I stayed right behind Laura Bennett until the one and only turn buoy about 350 meters into the swim. 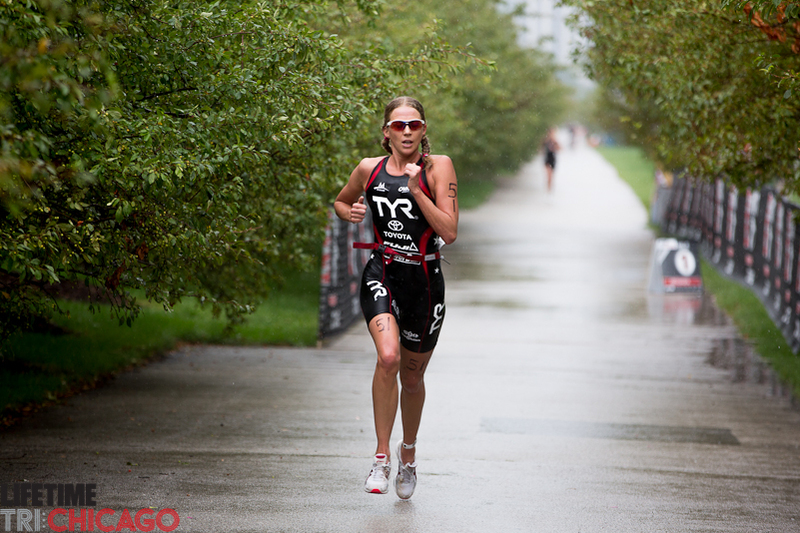 Right after making the turn, I was feeling strong and wanted to pick up the pace and attempted to gap the field. I lead the swim the remaining 1100 meters. Several times I put surges into the women behind me, but Laura and Annabel are strong swimmers and it’s hard to put separation on athletes behind you especially when they can follow in your draft. With 20meters to go in the swim, I was quite surprised to see Laura Bennett surge up next to me (going after the swim prime). Never the less, I surged and did my best to exit in front. Laura exited up the stairs at the same time; however, the prime line was 800 meters down the road in transition. With putting my shoes on, I lost about six seconds, but it was well worth keeping my feet safe from any unforeseen objects! Once out on the bike course, it was all about getting into a rhythm and feeling some pain the beginning of the bike, it was raining very hard. I was having trouble seeing the road since my visor was filling up with rain drops. I tried wiping my visor, but my hands were wet, so it did not do any good! I ended up trying to bang my helmet with my hands and trying to knock some of the water droplets off. Mid-way through the bike, the rain let up a bit and my vision improved. However, towards the end of the bike, the wind and the rain picked up again and I was so ready to get off the bike, happy to have made it safe and sound….but, not quite safe and sound! The very end of the bike course consists of a u-turn into a downhill section followed by a right turn into transition. I pulled one of my feet out of my shoes into the U-turn and was having trouble getting my foot back on my shoe. I stood up to get my foot back on top of my shoe and accelerated a few pedal strokes (BIG mistake). Since I was heading into a downhill, I needed to be going really slow since the road was covered in oil with the new rain. I tried braking down the hill and managed to recover from fish tailing twice. On the third fishtail, I simply ran out of room as I tried to turn and went down. I was in a bit of a shock, but got up right away and looking for my missing bike shoe. I heard Nate yelling at me to run my bike in and I did just that (I had to run with my bike an extra 50 meters before the mount line). Once I got onto the run course, I began assessing my body. Everything felt okay, but my left hip was a little sore as well as my left foot. Half way through the run, I could see where the rest of the women were on the course and knew if I could just get to the finish line in one piece I would be okay. Hy-Vee was definitely in the back of my mind, so I did not want to waste extra energy that I will need for next week. I crossed the line with my 5th Lifetime Fitness Toyota Cup Series win this year and my 26th win of my career. Hunter Kemper earned his first victory in Chicago on the men’s side. 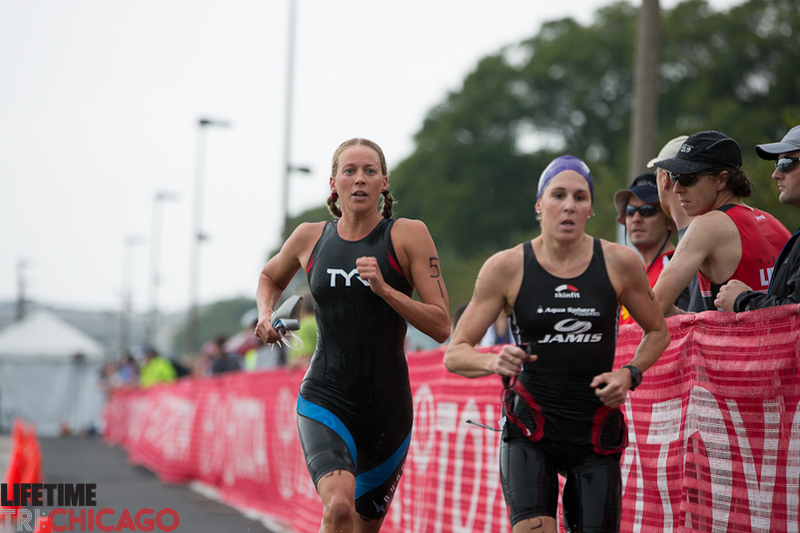 As I write this race report, I am headed to Des Moines, Iowa for Hy-Vee on Sunday. Hip is a little sore, but I am sure it will be good to go on race day. I am fortunate I did not get too banged up from my body hitting the concrete. I am looking forward to spending the week in the mid-west as it will feel just like my hometown. Chicago is a great city and it was capped off with dinner with friends at Benny’s Chophouse. 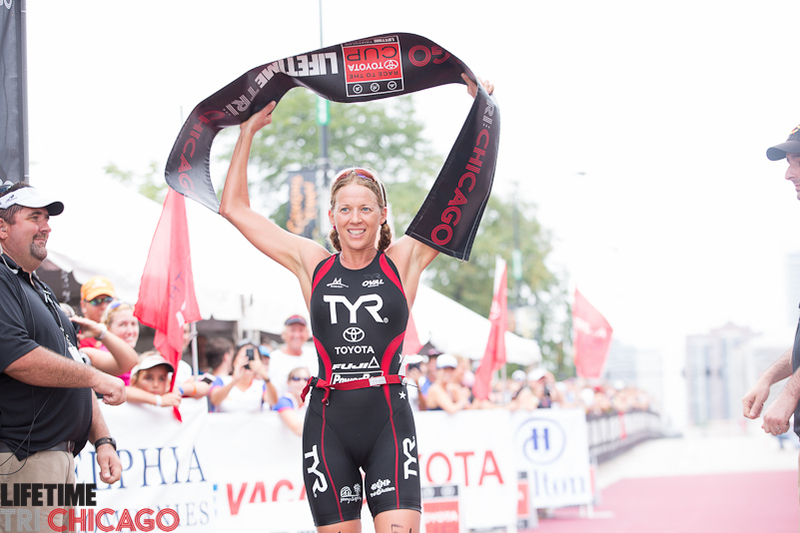 I look forward to returning again soon and next time in Chicago odds are it will be sunny on race day! Thank you to everyone for the tremendous support in helping me get to the start line!